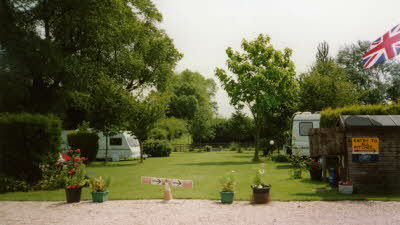 You will always find a warm welcome at Coombe Farm CL, a pleasant location, restful and quiet. 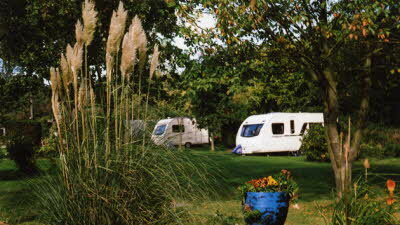 All pitches are separated by shrubs etc. 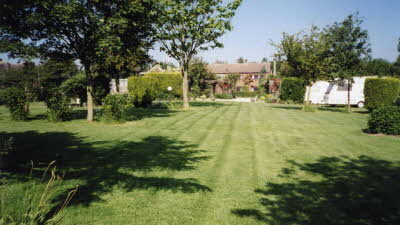 always kept short mown, pitches pre-levelled and have a waste water connection, no need for your grey water containers, as well as hook-ups on every pitch. Please note this site is not suitable for motorhomes. 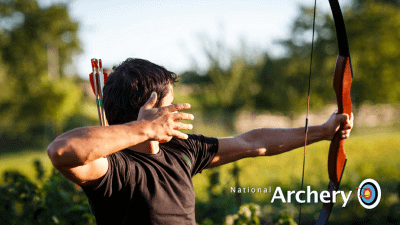 Les will take you on a 'Freelander Safari' which includes some of Oxfordshire and Buckinghamshire's prettiest villages, which by the way are used by TV production companies for 'Midsomer Murders' and 'Lewis'. 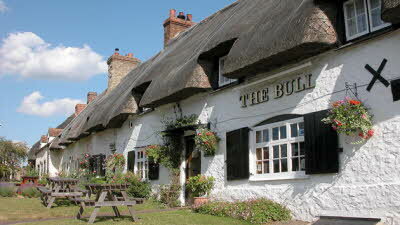 Our local pub the 'Bull' was used just a few months ago. There is a charge for this service and can include a call at a pub if you wish. On the wildlife side Kites visit us on most days along with squirrels and deer on occasions. The local shop, Post Office and newspapers are only a 5 minute walk. We also have an out of town supermarket 5 minutes drive from the CL. Other points of interest, we are just a few minutes' walk from 'The Bull Inn' our village pub, evening meals and lunches etc. by the village green. A few minutes further along the road is Raymond Blancs' restaurant Le Manoir aux quat Saisons. Our nearest town is Thame, a market town with street stalls on Tuesdays. It is a lovely old town with tea rooms etc. approximately 5 miles away, also the start of the Phoenix Cycle Trail. We have an hourly bus service to Oxford through the village or you can use the Park & Ride about 5 miles away at Risinghurst to access the city. Our local windmill has just been renovated and is opening summer 2014, and another one three miles away at Wheatley is already operating. We also have Chinnor Steam Railway open Sundays with cream teas on board, that's about 9-10 miles. Then there's beautiful Waterperry Gardens with it's fine herbaceous borders, teashop and not to be missed, the Rural Country Museum about 5 miles. 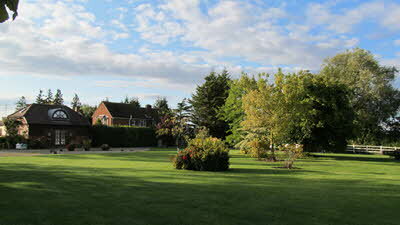 Waterperry is also home to the annual Art in Action event in July. 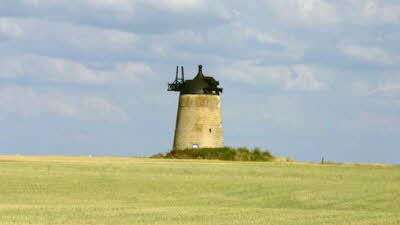 The Oxfordshire Way is also near and Milton Fishing Pools is only about 1 mile. We are also quite near to the Ridgeway Path, approximately 8 miles crossing the Chilterns. In the opposite direction approximately 25 miles are the Cotswolds. 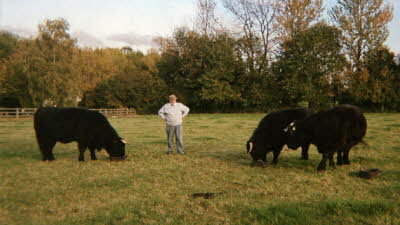 Just over the fence from the CL you will see our retired Welsh Black Cattle of the 'Coombe Herd'. We now only have a few, along with free range hens and ducks. Our free range eggs are sold in our Little Shop along with other goodies. There are also pamphlets of the local area for your interest. At the moment we are busy seeding our old meadow of about 2 acres with a wild flower mix. The previous comments sum it up - a lovely, well-kept site with Les being there to help and advise and he really makes you feel most welcome. There are individual, grass pitches with 16 amp electricity, the grey water also being linked into the sites drainage system (no need for Wastemasters). If you like nature you will not be disappointed – you cannot fail to see red kites, squirrels and pheasants plus the CL’s ducks, chickens and Welsh Black cattle grazing in the adjacent field. Access to the CL is good even for a twin axle caravan – we followed the directions in the Caravan Club handbook and had no problems. There are numerous walking and cycling opportunities in the area if you feel fit! Don’t worry the area is comparatively flat! We had a very relaxing break and would not hesitate in recommending the CL and returning at a later date. I have just returned home from my 5th (or 6th) visit to the CL (and I'll definitely be back). Each time I visit confirms my expectations and it has never been a disappointment. For me there is no downside and it is always a pleasure to see Les - who is always on hand to answer questions or help in any way he can. That it is adults only and no dogs is the icing on the cake. It also means that the two ducks and the two chickens wander around without any concerns and they are never a bother to anyone. It should be noted that it is only a farm in name - in the traditional sense this is not a farm at all! This is like a home from home and I have absolutely no hesitation whatever in recommending it. The site is pristine. 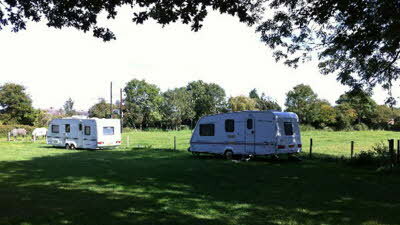 It is beautifully cared for and loved by its' owner Les.He has given real thought to the comforts of caravan members & I'm sure added ideas that he would like to have when away caravaning on other sites.It was especially nice to have your 'grey water' drained straight into a drainage system.The pitches are spacious and the site well kept BUT it was just too much like a club site for us personally. Rules to follow, lots of 'do's & don'ts'...such as no groundsheets. cars to be parked away from your van..o.k in good weather but not so good when the heavens are opening and you've left something in the car.There is a system for entering and leaving the site. The vans are all allocated facing each other but It would have been much nicer to watch the cattle graze in the field behind us & not our neighbours grazing! Don't make the same mistake as us and turn into 'Green Hitchings' as this will lead you into a housing estate which you can exit but it is awkward when towing. Go straight down the road and the site is then clearly visable on the right. There is a charge of £1.50-£2.00 per. night for an awning. The site is all you could want if you like 'club sites' but in my opinion it isn't the ordinary CL. This CL has been going since 1982. It is well kept and clean. The directions are spot on and the welcome by Les second to none. Access is no problem, just take care through the village. There is a small information shed on site which is stocked daily with fresh eggs and freshly made fruit pies/cakes which are all excellent and reasonably priced. Payment for the site fees is by cash only and Les asks that this is made the day before you leave. There are some lovely walks from the site and the village owned pub "The Bull" is not to be missed for its food (check menu in shed and opening times). The numerous red kites and buzzards can be seen daily as well as the ducks,chickens and pheasants. Use Thornhill park & ride for a visit to Oxford and if you are a follower of Midsomer murders talk to Les about his Freelander excursion. A site that we would be happy to return to. Thanks. 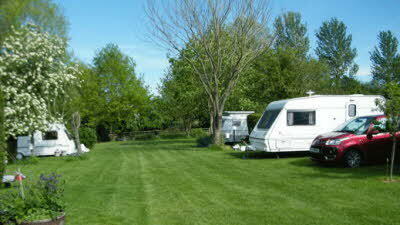 This is a perfect site, caravan pitches are level and lawned, each pitch is set out in its own area with trees and flowers. Ducks and chickens potter about and you look out over green field. 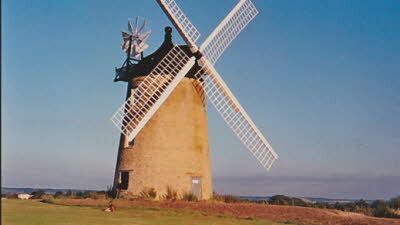 The village nearby is like a bit of Old England but best of all is the warm welcome from Les. Thank you Les for your warm welcome and for the obvious care you take of your site.